This is another really awesome dish from Alice Storey's 200 Super Salads . A friend recently pointed out that I've done a lot of posts on Greek Food. Is there a trip to Greece in my future? 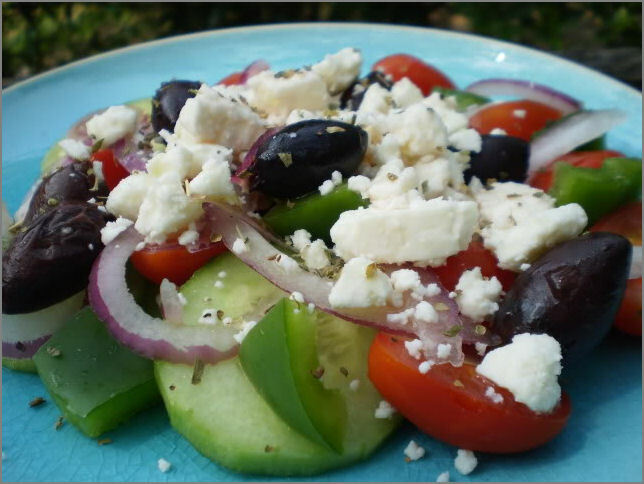 Cut the cucumber and tomatoes into 1/2-3/4 inch chunks and place them in a large salad bowl. Cut the flesh from the bell peppers and carefully remove the ribs and the seeds. Finely slice the red onion and add to the bowl with the olives. Pour the dressing over the salad and toss carefully. Transfer to serving bowls and scatter feta cheese evenly over each bowl.